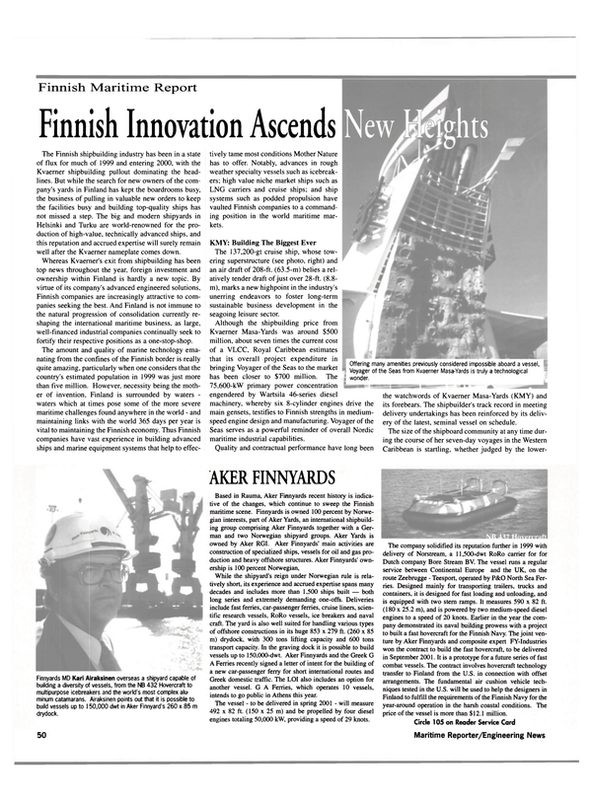 The Finnish shipbuilding industry has been in a state of flux for much of 1999 and entering 2000, with the Kvaerner shipbuilding pullout dominating the headlines. But while the search for new owners of the company's yards in Finland has kept the boardrooms busy, the business of pulling in valuable new orders to keep the facilities busy and building top-quality ships has not missed a step. The big and modern shipyards in Helsinki and Turku are world-renowned for the production of high-value, technically advanced ships, and this reputation and accrued expertise will surely remain well after the Kvaerner nameplate comes down. Whereas Kvaemer's exit from shipbuilding has been top news throughout the year, foreign investment and ownership within Finland is hardly a new topic. By virtue of its company's advanced engineered solutions, Finnish companies are increasingly attractive to companies seeking the best. And Finland is not immune to the natural progression of consolidation currently reshaping the international maritime business, as large, well-financed industrial companies continually seek to fortify their respective positions as a one-stop-shop. The amount and quality of marine technology emanating from the confines of the Finnish border is really quite amazing, particularly when one considers that the country's estimated population in 1999 was just more than five million. However, necessity being the mother of invention, Finland is surrounded by waters - waters which at times pose some of the more severe maritime challenges found anywhere in the world - and maintaining links with the world 365 days per year is vital to maintaining the Finnish economy. Thus Finnish companies have vast experience in building advanced ships and marine equipment systems that help to effectively tame most conditions Mother Nature has to offer. Notably, advances in rough weather specialty vessels such as icebreakers; high value niche market ships such as LNG carriers and cruise ships; and ship systems such as podded propulsion have vaulted Finnish companies to a commanding position in the world maritime markets. KMY: Building The Biggest Ever The 137,200-gt cruise ship, whose towering superstructure (see photo, right) and an air draft of 208-ft. (63.5-m) belies a relatively tender draft of just over 28-ft. (8.8- m), marks a new highpoint in the industry's unerring endeavors to foster long-term sustainable business development in the seagoing leisure sector. Although the shipbuilding price from Kvaerner Masa-Yards was around $500 million, about seven times the current cost of a VLCC, Royal Caribbean estimates that its overall project expenditure in bringing Voyager of the Seas to the market has been closer to $700 million. The 75.600-kW primary power concentration engendered by Wartsila 46-series diesel machinery, whereby six 8-cylinder engines drive the main gensets, testifies to Finnish strengths in mediumspeed engine design and manufacturing. Voyager of the Seas serves as a powerful reminder of overall Nordic maritime industrial capabilities. Quality and contractual performance have long been the watchwords of Kvaerner Masa-Yards (KMY) and its forebears. The shipbuilder's track record in meeting delivery undertakings has been reinforced by its delivery of the latest, seminal vessel on schedule. The size of the shipboard community at any time during the course of her seven-day voyages in the Western Caribbean is startling, whether judged by the lower- bed passenger capacity measure of 3,138 or maximum of 3,840, together with up to 1,180 crew. This ship has occupied some of the best minds in interior design as well as some of the most innovative minds in naval architecture. It furthermore denotes the attainment of a new milestone in the passengership domain as regards marine engineering technology, expressed in her refined diesel-electric power and propulsion system incorporating a triple Azipod configuration. Voyager of the Seas is emphatically also a new showcase for the concept of redundancy, applied to the main shipboard operating systems, and signifying central concerns with issues of reliability and safety. Power of the Pod The creation and integration of podded propulsion systems - arguably one of the most innovative maritime technological advances ever — eminates wholly from the Finnish maritime cluster of shipbuilders, marine equipment suppliers and technology innovators. The Finns, with a long track record in thruster technology, were the leaders in the podded drive concept, first applied in the form of a 1.5-MW Azipod unit to a Finnish waterway service vessel in 1991. The most widely employed system to date, Azipod was originated by ABB Industry and Kvaerner Masa-Yards (KMY), but Italian shipbuilder Fincantieri is also a shareholder today in the system's proprietary company. The growing uptake of integral electric- driven, podded propulsors in the most capital-intensive sector of the cruise shipping industry, has forever altered the established position of conventional propulsion systems in an important segment of the market. Having established a foothold in the offshore sector, the concept will undoubtedly find increasing application with the next upswing in investment by the offshore oil and gas industry. The relative paucity of orders for podded drives in areas where precision handling is paramount, as with icebreakers, cableships, ferries and specialized tankers, belies the extent to which such systems are being written into draft proposals or discussed at the project planning stage. The concept is especially apposite to vessels with varying service profiles, particularly where high maneuverability is required. The long-term sales impact of the industrial commitment from the design engineering and manufacturing side cannot be understated. In each case, podded propulsors are the products of pairings entailing major players in propulsion and electrical engineering, entailing direct or indirect links with leading shipbuilders, in certain instances. As a progression on thruster technology, the basic principle is that the conventional shafting, propeller and rudder system is replaced with a 360-degree rotatable thruster unit also encapsulating the electric motor. Space savings are thereby achieved within the hull, while the efficiency losses from reduction gearing, long shaftlines, rudders, stern thrusters and also brackets and bossings are eliminated. The first cruise ship application of podded electric drive was Carnival's 70,400-gt Elation, commissioned in early 1998 and fitted with two 14-MW. Finnish-developed Azipod propulsion units. Current newbuild references include the entire Carnival group program, Royal Caribbean's prestigious Project Eagle series, as well as Hapag- Lloyd's Europa, all at KMY yards. As a measure of its influence, the Azipod system figures in each of the substantial number of cruise ship newbuilds currently in hand and on order at KMY. By mid-1999, confirmed orders for the device had totaled 40 units of an aggre- gate 487,000-kW, including a total of 29 in 13 cruise ship applications. The adaptability of the Azipod technique is implicit in a design range, which extends from just 500-kW to approximately 25-MW. The flexibility and power of the system was clearly pointed out during sea trials of Royal Caribbean's Voyager of the Seas the world's largest cruise ship which is equipped with three 14-MW pods. During trials, the vessel topped out at 17 knots ... backwards! Wartsila NSD Wartsila NSD is a perennial powerhouse for shipboard power needs. A dominant force in the many markets it serves, the company is the major player in the medium speed diesel engine market, with an estimated 28 percent of market share, as well as in the lowspeed market, where its Sulzer engines dominate. Owned by Finnish engineering group Metra, the company has led a wave of marine propulsion consolidations in recent years, most notably with the New Sulzer Diesel acquisition of a few years ago. But while much of the focus has been on consolidations, one of the company's more notable hook-ups has been dismantled, as it announced that it and co-owner Cummins Engine Company would split their 50/50 joint venture Cummins Wartsila in early 2000. In announcing the split-up, Metra said the portion of the venture to be transferred to its engine building division Wartsila NSD would generate net sales of about $133.5 million this year, or about twothirds of Cummins Wartsila's business volume. Splitting the venture, which was formed in 1995, will reportedly cost about $20.6 million. Despite the extra one-off cost, full-year 1999 earnings of Metra's biggest division Wartsila NSD will improve on 1998, but will reportedly still be in the red. The split up was reportedly to allow the two companies to focus on the engines that best suited their core businesses, to achieve synergies and improve profitability. Wartsila NSD will take over the manufacture, sales and service of the CW200 and CW220 diesel engines, and a plant at Mulhouse, France, and Cummins would take responsibility for the CW170 and CW180 engines and a factory at Daventry in England. Wartsila NSD would also take charge of global service for engines made by the joint venture's predecessor, SACM Diesel, and the manufacture and servicing of UDX engines. The operations transferred to Wartsila NSD would be merged into the company's French subsidiary.